New book, 64 pages, RAID05. 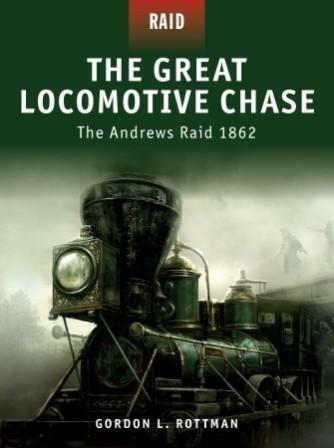 In April 1862, the stage was set for one of the greatest locomotive chases in history. Union forces planned to steal a train and travel at high speed to Chattanooga, Tennessee, disabling the line as they went, in order to cut off vital rail supplies to the Confederate stronghold of Atlanta, Georgia, some 100-plus miles to the southwest. What they hadn't banked on was the dogged determination of one man, train conductor William Fuller, who, after realizing his train had been stolen, began a frantic pursuit, first by handcar, then by top-speed locomotive, dealing with derailments by running miles on foot to the next station, and single-handedly removing drag ties from the track in front of his train. The raiders were so hotly pursued that they had no time to inflict serious damage on the tracks and could not stop to gather more fuel. Just north of Ringgold, some miles south of Chattanooga, The General ran out of wood and the raiders scattered into the forested Appalachian Mountains. All were captured within days and sentenced to death. Discover the history of one of the most colorful and dramatic episodes of the Civil War as Gordon L. Rottman expertly recounts this incredible tale of sabotage, robbery and raiding on the rail lines of the Deep South.